Explanation: Brilliant Venus falls out of the evening sky as March ends, but Jupiter and Saturn remain well up above the western horizon. Jupiter blazes forth above and to the left of a slightly fainter Saturn in this telephoto picture taken on January 19th. 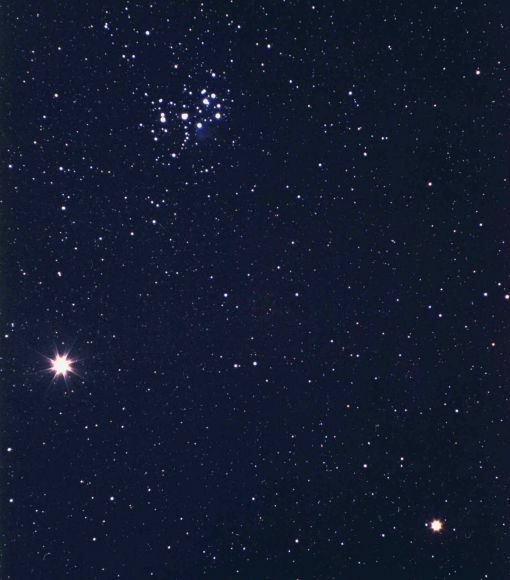 Near the top lies the lovely Pleiades star cluster with suggestions of its characteristic blue reflection nebulae. 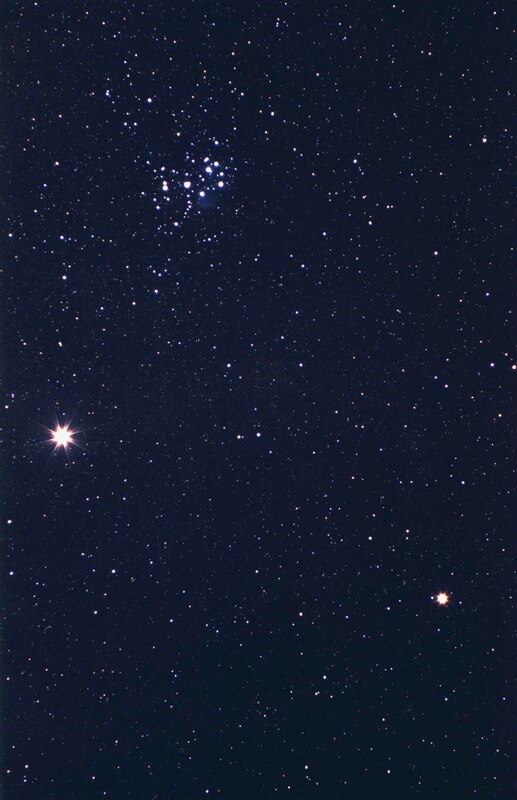 These planets and the Pleiades have a similar, easily recognizable orientation in the Spring night sky. Also known as M45, the 45th object in French astronomer Charles Messier's famous catalog, the Pleiades will likely soon be checked off many stargazers' tally lists. For northern hemisphere observers this weekend offers a prime opportunity to complete a Messier Marathon -- the viewing of all 110 Messier catalog objects in one glorious dusk to dawn observing run. This weekend it will also be possible to complete an all-planet marathon, observing all the solar system's planets in a single night. And if you still need something to look at, the International Space Station could also be visible arcing through the skies depending on your location, but Mir will not.